One sofa or two? Help me decide! Well things are moving along quickly at the new house and all of a sudden I need to get serious about planning the spaces! I already have a good idea of what I'll be doing with most of the rooms but I still can't decide on the family room. SO much has happened in here since! The floors went down this week -- be sure to follow along on my Instagram account (and the stories there) to see updates! I am SO thrilled with the hardwoods!! I'm pretty sure the tile surround will go up this week too. I have two ideas in mind for the layout in here. This is the only room in the house that we'll be getting a few new pieces of furniture. (We don't have a dining or living room in this house so we actually sold furniture from the last house.) I'm pretty sure I know what I'm doing on the sides of the fireplace but I have to decide on the furniture for the middle of the room. One thing I LOVE about this room is that everything will float in the middle. I think it will feel so open and airy and I'm super excited about figuring out this space. This is where I'm trying to decide on how to place them. Those of you that know me know that even though I try hard to fight it, I'm a symmetrical girl at heart. I mean, it hurts me when I can't do the same on both sides...of whatever. I know, I know. That one photo has four chairs, but still...SYMMETRY. I love thee. We got the sofa for a GREAT price on sale at a local furniture store, but I'm not sure they still have it or if I could get it for that price again. 😬 I think I'm going to call to see if it's possible. It's aesthetically pleasing. When I see two sofas it just calms me and feels "right." Two sofas facing each other are more furniture but seem to keep the room more open. I love that the end of the room would be open to the rest of the great room. It can go a little more formal -- but I think this depends on the sofa style too. There's another option that's a good one too -- to place the sofa directly in front of the TV and then put the two chairs facing each other on either side. I can't even find good photos of this option, buy you know what I'm saying, right? Maybe even get a couple more chairs so there would be a set on either side of the room. I got those on sale, so that wouldn't be too bad if I got them at the same price. I love that we could just sit on the sofa anywhere and see the TV. I think it could start to feel a little busy with four smaller furniture pieces. Having the sofa at the "end" of the room kind of closes it off. Do you have either one of these family room layouts? How do you like them? I'd love to hear the good and the bad about both! I think I'll make a decision after we get in -- I'd like to see how the sofa looks in the room first, and then decide if it will feel too tight for two. Hmm...that's a tough one with pluses or minuses to each. I do agree that four chairs might be overkill. Could you get an upholstered ottoman that matches the sofa to make it more sectional-like? That way you will have more TV seating if you chose one couch, don't have to totally lie down if you chose two, and then the ottoman can seat more guests too during gatherings. We have a layout similar to this. We have a sofa facing the tv and a loveseat perpendicular to it. I'd love to replace with a sectional someday, just to have more seating. We then have two chairs across from the sofa so it sort of forms a u-shape. I think I would like the idea of two sofas if it were just a sitting room, but craning my neck to watch tv holds no appeal to me. My family room is this exact layout, and the staircase to the right has always been difficult for me to work around. Nothing looks right or seems to fit when I place furniture on that side. I have been through three room configurations, three couches, including a recent sectional which I hate, and a recliner my husband insists upon. I will be thrilled to see your final plan; it may be the answer to my prayers. Good luck and congratulations on your new home. I have a two sofa layout and I actually put one sofa opposite the tv and the other on one side, like a sectional would be. I did this because I live on a lake and the view is spectacular. The tv is visible from either sofa and the view is too. 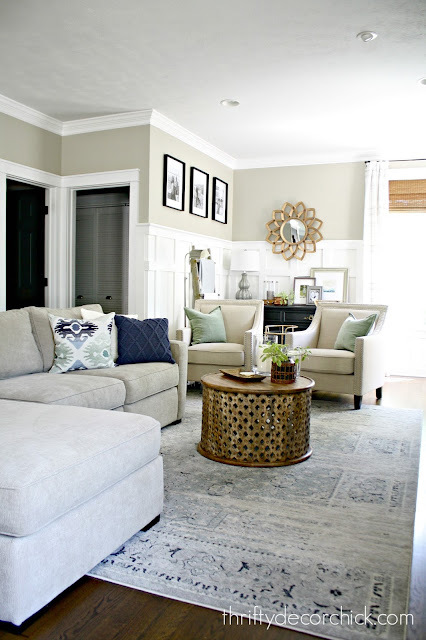 To add symmetry you could add swivel chairs on the side across from the second sofa. I plan to do this when funds allow. I like this! You can have a few options for the 2 sofa idea: parallel or perpendicular. I also like the un-matched look; Lauren Liess had a gorgeous leather sofa and a slipcovered one across from each other and it was great. I am on team two sofas, but laid out like a sectional with two chairs forming a u. But I am in a tv watching family and honestly, our day to day comfort is more important to me than when guests come over. We have a sectional that floats in the middle of the room, but we anchor the view from the kitchen with the Everett table and it makes things look more intentional. I love the look of 2 facing each other, but I agree it can look formal. And every time I see that setup I think "how do they watch TV?" I agree with Michelle H above - your family's day to day comfort is more important than occasional guests. My vote would be 1 facing the TV with 1 chair on either side. Either way I know it will look great, because everything you do looks great! I can see I am in the minority, so far, but I like the idea of the one sofa facing the fireplace and your two chairs flanking either side. If there is space, you can put a console table behind the sofa with lots of pretties to make it look nice. (I'm not a fan of seeing the back of the sofa.) But I'm not a decorator, ha ha. This is exactly what I was going to write, including the "I'm not a decorator" clause. I'm curious why you aren't going with built-ins beside the fireplace. The chairs flanking the fireplace would be so cozy for the winter, and you could have a cute ottoman/footstool for one of them. Then you could have your Christmas tree in the corner simply by moving one chair. I've spent way too much time trying to move sofas and loveseats and chairs around, can you tell? To me it's all about the tv-sprawling and making the Xmas tree addition be as low-stress as possible. I say go for function over aesthetic. My sister has two sofas facing each other and everyone gets a crick in their neck from trying to watch TV. :) I have a large sectional in our family room and love it. Functionality and comfort over aesthetics hands down. How about couch facing tv, and your two chairs and a second couch or love seat facing each other? I am in the camp of two, but U-shaped as well. One directly facing the tv, the other perpendicular to it (facing windows?) with the two chairs directly across. Square shaped coffee table for sofas, and a round for between the chairs. That way one or two people can be lying down on the sofas, or one lying two sitting, and extra chairs for guests. Tables for snacks/drinks. The sofa facing the windows would create a walkway effect between it and what I am thinking is a wall/staircase? I have some thoughts, since you asked. 2. You've cut a lot of seating from old house to new. I would think about how much you entertain and how big those gatherings are and how many guests need a place to sit that has a back. If it's quite a few, you might consider adding two more chairs OR a love seat facing the two chairs. 3. If you entertain, but it's casual, I definitely think keep your sofa facing the TV and get some cushy ottomans for the chairs for overflow seating and for foot rests in front of the couch when you want to stretch out. I don't know if you'll have a raised hearth or not, but many of my friends grab a throw pillow and sit on the hearth. 4. I know you love symmetry, and you have a vision, but perhaps two different chairs to add into the mix? I tend not to like too much 'matchy-matchy,' but I like symmetry too. So excited for you and know you'll make great decisions and change them into even BETTER decisions years down the road. My daughter has her sofas at right angles to each other - one faces the tv. I think she likes it. I know I do. She has a large ottoman as well, and we snuggle up under blankets and have movie night once a week. The way your ceiling slants, it's begging for an asymmetrical arrangement! This was my thought! I think the left couch will feel "heavy" with the lower ceiling. I would say couch facing TV, couch perpendicular on the right side facing the windows, and two chairs on the left side to lighten up the lower ceiling on that side. Vicki and Casey, I completely agree with you two. I have my living room arranged the way Casey suggested and my ceiling is lower on the chair side. I think there is a major benefit of having two couches and two chairs just from my recent personal experience so that is definitely my vote. Cant wait to see the final result! I was at a house recently where they had two different sofas set at 90 degree angles to each other, with two matching chairs parallel to one of the sofas, but set square, not angled, if you can see what i mean. Th structure and orderliness appealed to my sense of symmetry, but the different pieces appealed to my sense of whimsy! Hi! I have followed you for about a year now. Your question is a good one! I too am building and have the same type space. I have been researching the same thing. Thinking couch in front of tv, loveseat on one side, 2 armchairs across from loveseat on other side. Congrats on your wonderful home! I suggest starting with what you have - sofa and two chairs- and try a few configurations (Sofa facing TV with chairs on either side, sofa on one side and two chairs on the other, etc) and live with it for a while. If you don't like it, then go ahead and get a second sofa! the components. I stockpiled new furniture I thought would look great in our new house and once we got in and figured out how the spaces worked for us, I now have pieces in storage that I have no need for. I have our couch kattikorner, front right, toward the fireplace. A large chair and ottoman on the right wall of windows, to the right of couch, and down slightly turned in ward. 2 recliners on the wall facing fireplace with an end table and lamp between them. Coffee table in front of couch. Nothing on the left side due to a wide opening. It's been my fav arrangement so far, and has gotten the most compliments. More people can watch tv comfortably with a good view as well. I do have a chair in front of the left bookcase next to fireplace, at an angle facing inward - into the room. We pull it out a little and turn it toward the tv, which is above the fireplace, when we need to. So far so good! I think if the room is large enough, 2 sofas would be great! Two sofas. If your guests find you have only the sofas to sit on, they will sit!! After all, no-one is going to stand up for an entire evening, eh? Enjoy planning! I like the sofa and 2 chairs option for versatility. In the other hand, having 2 sofas to lie on for tv watching sounds pretty awesome. Maybe even add a chair facing the tv, perpendicular to the other seating. By the way, did you put at least one floor outlet in there for lamps? Forgot to mention, i tried the sofa facing our tv in the last house, similar to your layout, and hated the way it blocked off the room. Chairs facing the fireplace give a more airy feel. Long time reader here but first time commented (I felt so strongly that I had to share my opinion!) I think you should definitely go with matching sofas across from eachother. This room is just calling out for it and I think a sofa with the two chairs across from it might look haphazard. 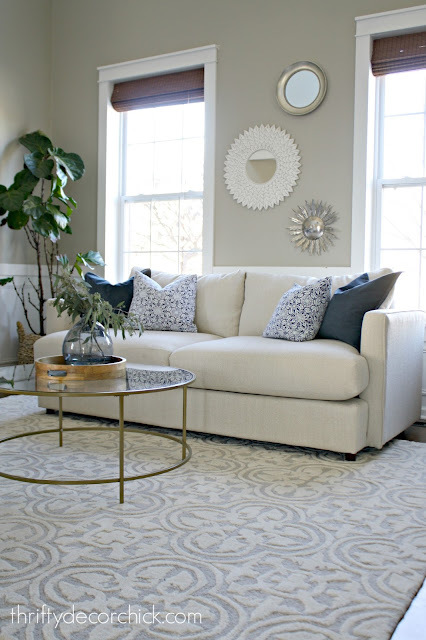 As for guests opting for chairs over a sofa, what if you added your two existing chairs to the end of the arrangement, as seen in your first and last inspiration photos? Two for sure if the budget allows. I love that you'd both be able to get super comfy while watching tv. Two chairs on the end - love your inspiration pics. I also try to place furniture to encourage interaction versus staring at a TV (unless it's a media room, of course). And not a fan of looking at the back of a couch when entering a room. Have fun!! I have the 2 facing sofas layout. TV on one end, fireplace at the other end. It's the only layout that's even possible in the room. I thought it would be perfect but we really hate it! Having to turn our heads left to watch TV is awful and gets really worse and annoying when you get to the "progressive lense" stage in life! No matter what I love about my next house, if I can't face the television head on, I won't buy the house. My husband agrees! Formality is great in the LR. For the famly room go for comfort. It's your family home. Guests will love it and not care because you are you and you will make the comfort look great as well. I love the feeling and look you get with two sofas. This room is screaming for that! One will block it off. If you love to lay on the couch you just take turns. ;) We had a shorter couch in that position to a TV and I would sit at the far end and put a pillow on my lap. My daughter would lay down on my lap. We have also sat like in a boat--does that make sense? It's cozy and can't be done for hours on end but an hour and I was fine. (She was 12 at the time.) I think you can't NOT do the sofas facing and two chairs angled at the far side from the TV. 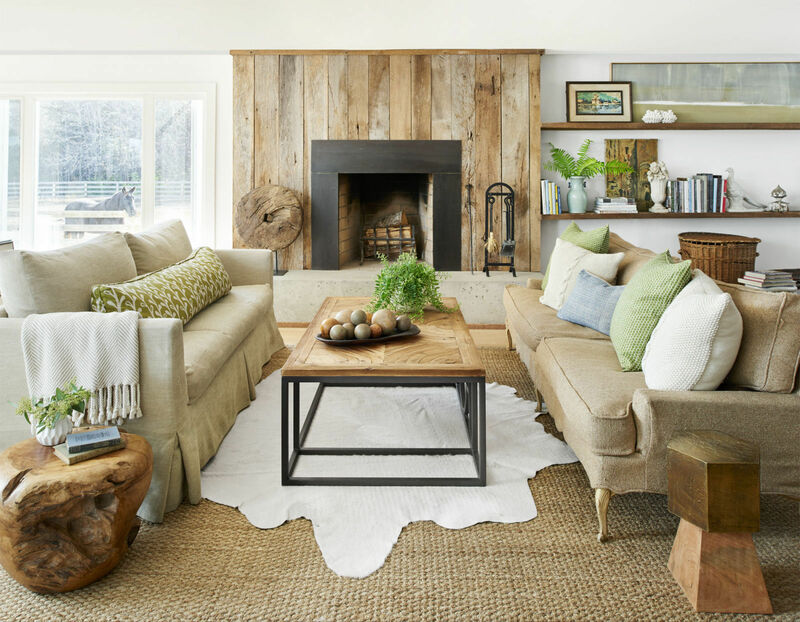 I had a gathering room with a similar layout and we LOVED having two couches across from each other ... great converaation and coziness!! However, we did not have a TV in the equation (was in another room) and I definitely think it would have been awkward watching TV from that arrangement. Function of room is top priority in my book. You may want to consider recliners. There are some which are very tailored. It is nice to have a chair that leans back a little, lets you put your feet up, and lets you fall asleep while watching TV. Look at all of the beds that are now come with raising your head or feet to allow for better sleeping. And, as you get older, a recliner provides better support than laying down on a couch. I'm talking knees and back. Wow! I prefer the 2 sofa arrangement ... or 2 sofas, 1 love seat (U-shape). Why? (2) Which one of you will want to sit in a chair? (3) Guests will sit wherever there is space to sit. Definitely 2 sofas / 2 chairs !!! Symmetry for the win EVERY time. Before buying another sofa, try the arrangement using chairs facing the other sofa first. Live with it for a while and see if you are totally annoyed like I am with our perpendicular to the TV! 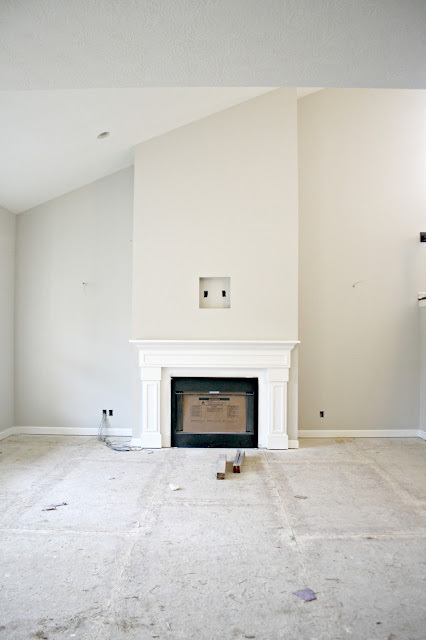 Other possibilities: put TV somewhere else besides over the fireplace. 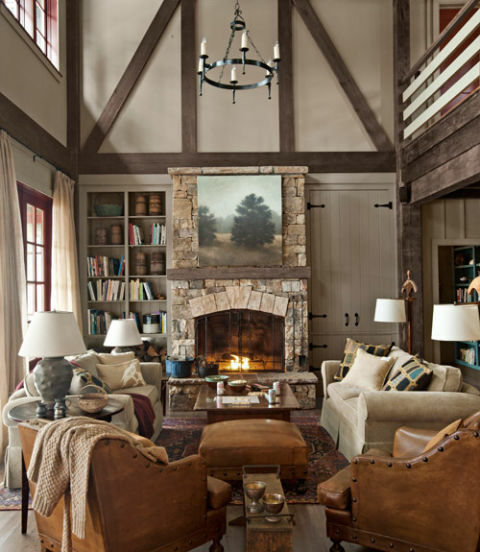 I personally like the cozy feel of a sofa and chairs kind of encircling the fireplace. Put an interesting long sofa table or bench at the back of the sofa, and you will love the effect! My vote is the two sofa! Your new space would be perfect for this and I agree with you - it looks and feels right. If your living room is long enough you could have two sofas facing each other, and two chairs with ottomans facing the TV. The sofa looks short enough that it might work. That way you get the look and function you want. My inclination would be to try living with just one couch before you buy the second one. Right now it is an open space and you are guessing. Move it, see how your items you already have work in the space. Because of the asymmetry of the room, I'd consider balancing it with a U-shaped arrangement. Two sofas in an L-shape, with the second sofa on the side with the higher ceiling, and two side chairs on the lower side with a small accent table between them. Large coffee table as an anchor to the arrangement. If you think about it, a U is still a symmetrical arrangement, but balanced out slightly to relate to the room's architecture. I feel like this is what the room's contemporary flow is "asking" for! It will be a beautiful space! If it wasn't for the tv, I'd say 2 sofas facing each other but it would force people to crank their head or lay down. Our last house we had the sofa in the back facing the tv and 2 chairs on either side but it wasn't as big as yours. I like the idea of the sofa in the back with a sofa table and 2 chairs on the lower ceiling side and either a love seat or 2 chairs on the other. That way it's comfortable for tv watching for your family and still works well for company. We have a sectional and another chair in this house in a U shape and it works for us. It's going to be a beautiful room whichever way you decide to go. I've found that when I purely choose function in a room over what I love, every time I walk into that room it's like an itch on my brain. I want it to look pretty! Two sofas facing each other are perfect for this room and will keep the room open to the kitchen. Add the two chairs facing the fireplace for extra seating. Choose what you love! It's worked well for you so far!! Hahaha I'll just remind you that you won the La-Z-y Boy Design Dash.